What boggles the mind a bit is the following: my dear saintly father always marveled at the fact that he and Fernand Gignac had the exact same age, yet dad looked so much younger. Gignac looked several decades older! Dad, just like so many others, marveled at the staying power of Gignac's and of another artist with whom Gignac bore some resemblance; le Père Gédéon! Doris Lussier -Gédéon's true name- would put on a lot of make-up though to look that old! Dad looked younger - but Gignac was the one who kept his youthful voice until the very end. Indeed, listening to his singing from the 1950s and from his very last public performance in 2004, the voice is unmistakenly the same. Dad was not so lucky in that department, as he lost his voice in 1993, the unfortunate result of a stroke. He'd never speak again. I'd never hear his voice again. May be why this Ultravox song I posted here this week, "The Voice", is one of my favorites too... It is about God's Voice and dad's voice as well - both, at once. 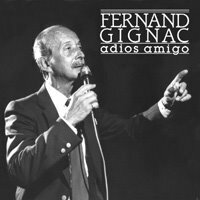 Gignac's voice was smoother than many others - if he hadn't sung in French, the whole world would have heralded him as a finer lounge singer than Tony Bennett or even Deano and Sinatra. Honest - I kid you not. He was that good. A natural. Most "mind-boggling" of all is that both dad and Gignac had to pass on in 2006 - both had been born in 1934 as well. Dad never got to meet him - he met another instead, Gilles Vigneault - a fervent separatist he is too and not nearly as good a singer. That almost turned very sour as Vigneault clearly only had eyes for my mom, who had just recently arrived in Québec... Dad was an Omar Sharif lookalike (or is Omar my dad's lookalike? I think so too...) and mom... The closest approximation in those days would be, in hindsight and retrospect, "a forerunner of Julia Roberts" - yup! Both Fernand Gignac and João Jacinto Borges Pimentel were destined to last only 72 years upon this Earth. Now they meet up at last - in Heaven. It is always good to see prophecy fulfilled or in the process of fulfilling itself - but when said prophecy is really not that at all and nothing more than a lucky shot in the dark, well then we must conclude that something else is amiss there... Nothing kosher either! Or, as they'd say around here, oddly enough with the exact same significance and meaning, "c'est pas catholique"! Such as the cronie of these would-be dangerous people that told me that we were experiencing "the calm before the storm" around here... Predicting trouble for myself and those close to me, certainly not for oneself, was the cronie effectively doing there - correct? Alas, for the cronie and other accomplices of said cronie, they all discounted a major component of the overall equation - Divine Providence. Today, said cronie sits with a hand heavily bandaged. I am not divulging how that came about - but predicting ill unto others will only result in it coming down upon yourself . Order to fruition; the first would establish Communism in Russia, the second would occur between Fascists and Zionists, and the third would pit Zionists against Islam — after which surviving earthlings would turn to Satan. Now THIS is the PERFECT example of someone in the wrong hitting a bullseye. This is, verily, what is happening. "Zion versus Islam" - it's coming! Live and on CNN instead of PPV! However, again, the would-be prophet here omits to factor in the DIVINE in there... "Surviving earthlings" will probably turn to the wrongest of choices, aye - but that is only because everyone redeemable, worthy in the least, everyone any good at all will have long been RAPTURED by then! And, oh yes - I would be remiss if I did not add that we can assuredly lump them all into the same sorry pile, down by the pit - freemasons, illuminati, satanists... Hey, if Hilary and Dubya have ties to them, I am sure we'll all agree that they're no good at all! Now for some TRUE, GENUINE, 100% OFFICIAL PROPHECY! Never let it be said that TLB Prime does not give you the good with the bad! Indeed, the BEST... with the worst! The following comes from a little QUIZ you all can enjoy taking - test yourselves, why don't you! I give you an extra chance at a perfect score by giving you the advantage of peeking at the source scripture for each question inked by the good folks from www.Christianet.com, the hosts and creators of this quiz on... the End Times! These are all "true or false" questions, by the way. Fear not; I took special care to eradicate from here the correct answer - so you can elucidate it all by yourselves! With each passage from the Holy Bible, you sure can achieve that... And thus achieve perfection -a perfect score- and do as Jesus said that we do; be perfect like Our Heavenly Father Is Perfect! At least in this we can...! 1. Jesus told His disciples that famine, pestilence, and earthquakes would be signs that the end was near. 2. The disciples were curious about Christ's second coming and the end times. Matthew 24:3 - And as he sat upon the mount of Olives, the disciples came unto him privately, saying, tell us, when shall these things be? and what shall be the sign of thy coming, and of the end of the world? 3. The earth shall pass away, but not heaven. Luke 21:33 - Heaven and earth shall pass away: but my words shall not pass away. 4. There will be a time of restitution for all things. Acts 3:20-21 - And he shall send Jesus Christ, which before was preached unto you: whom the heaven must receive until the times of restitution of all things, which God hath spoken by the mouth of all his holy prophets since the world began. 5. The earth and the works of man will be destroyed by another flood. 2 Peter 3:10-14 - But the day of the Lord will come as a thief in the night; in the which the heavens shall pass away with a great noise, and the elements shall melt with fervent heat, the earth also and the works that are therein shall be burned up. 6. Jesus explained that there would first be tribulation and then the heavens would be shaken. Matthew 24:29 - Immediately after the tribulation of those days shall the sun be darkened, and the moon shall not give her light, and the stars shall fall from heaven, and the powers of the heavens shall be shaken. 7. We know we are in the last days because there are many antichrists in the world. 1 John 2:18 - Little children, it is the last time: and as ye have heard that antichrist shall come, even now are there many antichrists; whereby we know that it is the last time. 8. Christians cannot be deceived by the false prophets and christs. Matthew 24:24 - For there shall arise false Christs, and false prophets, and shall shew great signs and wonders: insomuch that if it were possible, they shall deceive the very elect. 9. The identity of the Antichrist will be revealed before the end. 10. An angel told Daniel that the vision God gave him was about the end of times. Daniel 8:17 - So he came near to where I stood: and when he came, I was afraid, and fell upon my face: but he said unto me, understand, o Son of Man: for at the time of the end shall be the vision. 11. When the time of transgressors has reached it's completion, the Antichrist will rise up. Daniel 8:23-24 - And in the latter time of their kingdom, when the transgressors are come to the full, a king of fierce countenance, and understanding dark sentences, shall stand up. And his power shall be mighty but not by his own power: and he shall destroy wonderfully, and shall prosper, and practice, and shall destroy the mighty and holy people. 12. In the end times, no one will depart from the faith. 13. In the last days, perilous times will come. 2 Timothy 3:1-5 - This know also, that in the last days perilous times shall come. For men shall be lovers of their own selves, covetous, boasters, proud, blasphemers, disobedient to parents, unthankful, unholy, without natural affection, trucebreakers, false accusers, incontinent, fierce, despisers of those that are good, traitors, heady, highminded, lovers of pleasures more than lovers of God; Having a form of godliness, but denying the power thereof: from such turn away. 14. Wars and rumors of wars are other signs that the end is near. The correct answer is ******************* = Matthew 24:6 - And ye shall hear of wars and rumours of wars: see that ye be not troubled: for all these things must come to pass, but the end is not yet. 15. Paul told Timothy that a time would come when the church would not endure sound doctrine. The correct answer is ****************** = 2 Timothy 4:3 - For the time will come when they will not endure sound doctrine; but after their own lusts shall they heap to themselves teachers, having itching ears. 16. As the false prophets rise and deceive man, sin will increase and love will decrease. The correct answer is ******************* = Matthew 24:11-12 - And many false prophets shall rise and shall deceive many, and because iniquity shall abound, the love of many shall wax cold. 17. In the last days, the Lord will remove His spirit. Acts 2:17-18 - And it shall come to pass in the last days, saith God, I will pour out my Spirit upon all flesh: and your sons and your daughters shall prophesy, and your young men shall see visions, and your old men shall dream dreams: and on my servants and on my handmaidens I will pour out in those days of my Spirit; and they shall prophesy. 18. When Christ returns, He will find people taking part in normal, daily functions. Matthew 24:37-39 - But as the days of Noah were, so shall also the coming of the Son of man be. For as in the days that were before the flood they were eating and drinking, marrying and giving in marriage, until the day that Noah entered into the ark, and knew not until the flood came, and took them all away; so shall also the coming of the Son of man be. 19. When mankind is seeking peace and safety, then destruction will come upon the earth. 1 Thessalonians 5:2-3 - For yourselves know perfectly that the day of the Lord so cometh as a thief in the night. For when they shall say, peace and safety; then sudden destruction cometh upon them, as travail upon a woman with child; and they shall not escape. 20. We are told to be watchful because we don't know what hour the Lord will come. 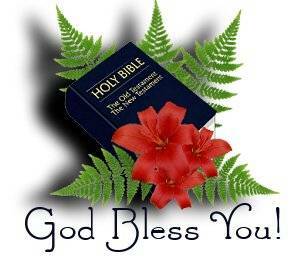 Matthew 24:42-44 - Watch therefore: for ye know not what hour your Lord doth come. But know this, that if the goodman of the house had known in what watch the thief would come, he would have watched, and would not have suffered his house to be broken up. Therefore be ye also ready: for in such an hour as ye think not the Son of man cometh. 21. The gospel will be preached throughout the world before the end will come. 22. We are not to be watching for the end times, but living our lives one day at a time. Mark 13:35-37 - Watch ye therefore: for ye know not when the master of the house cometh, at even, or at midnight, or at the cockcrowing, or in the morning; lest coming suddenly he find you sleeping. And what I say unto you I say unto all, watch. 23. The end of all things is now at hand. The correct answer is ******* = 1 Peter 4:7 - But the end of all things is at hand: be ye therefore sober, and watch unto prayer. 24. The New Jerusalem will be built by the believers who endure the great tribulation. 25. Jesus is bringing His reward with Him and He is coming quickly. Revelation 22:12 - And, behold, I come quickly; and my reward is with me, to give every man according as his work shall be. QUIZ: Copyright© 1996-2006 ChristiaNet®. All Rights Reserved. The Word - You Read It? The Voice - You Will Hear It Also...! That particular storm followed closely the kiss of Judas - and I was the recipient of a kiss of Judas myself recently, in a hypocritical display of sympathy for the recent passing of my saintly father, so, it stands to reason that I follow in His Footsteps all the way - hmm? That is Jesus' Footsteps, of course - not my saintly father. Although they are close, in my heart, Jesus takes the nod, always. Yesterday, on an odd and freaky encounter with some of the ookiest to be found in the auld neighborhood very soon after dusk, someone of ill repute told me, in the course of a very brief conversation, something that sounded like either a prediction or a threat. It went something like this: "it is a nice night... So calm... The calm before the storm". I immediately snapped back, as sardonically as ever: "A storm is brewing? Really? Is this PROPHECY? Or a prediction you're making...?" Hmm... I think that there can be no doubt that it was either a WARNING... Or a full-fledged THREAT indeed. A storm is brewing and the epicenter of it is gunning at ME - because someone close to me called the cops one too many times to report on the comings and goings of petty criminals who happen to be revengeful still! They may be planning to send me another nightly visitor at 4AM... ha! Here's hoping that they will all display their full radiance - in other words, their animated magical grace! "These gifs are mighty cool - don't mind if I pry... mate!" A thumbs up sign was in order though - don't you agree? 2) Health is inner peace. Healing is letting go of fear. An "attitudinal healer" among the medical establishment. Wow. And, most importantly too, that Dr. Gerald knows that, once again ultimately, we should aspire only to one thing and one thing only - to be One With God. Oneness With Our Creator. Oneness With The Universe. Oneness With The Cosmos. Rather, most probably a little something on astrology (aren't dime-a-dozen horrorscope authors proud...) penned by a well-known name today, for the whole endeavour spawned a LEGEND, nothing less! 8/14/1457 The first book ever printed was published by a German astrologer named Faust. He was thrown in jail while trying to sell books in Paris. Authorities concluded that all the identical books meant Faust had dealt with the devil. Still, the astrolger who wound up in jail in 1457 is not the assumed basis for the legendary tale - because the "Faust we know" and hopefully do not love at all "is widely assumed to be based on the figure of the German magician and alchemist Dr. Johann Georg Faust (approximately 1480–1540), a dubious magician and alchemist probably from Knittlingen, Württemberg, who obtained a degree in divinity from Heidelberg University in 1509." Despite such a "degree" (entirely disputable too, I would say) he had garnered quite a bad reputation for being such a huckster and a scoundrel. He he was also in prison (what a surprise) and, while there, in exchange for wine he "offered to show a chaplain how to remove hair from his face without a razor; the chaplain provided the wine and Faustus provided the chaplain with a salve of arsenic, which removed not only the hair but the flesh." It is no wonder that "the name of "Faust" has since become attached to any number of legendary tales about a charlatan alchemist (some claim "astrologer and necromancer"), whose pride, vanity, and vile hucksterism would inevitably lead to his doom"
I'm stuck with a hereditary background that probably has already numbered my days. I have enemies - more than anyone can imagine. Now really - I simply cannot stop with the gloom and doom! Such was my reply days ago to a comment left here; and such is my stance forevermore! It is every living being's right and natural instinct to act towards SELF-PRESERVATION. Granted, some have definite AUTO-DESTRUCTIVE tendencies... I'd rather be the latter myself -or, as I am really, a mix of the previous two here- than being as messed up as, say, a schizophrenic autophagic neurotic empty shell of a human being bent on nothing else but the annihilation of oneself and anyone that might *dare* to try and help out in going the opposite way from that nihilistic proclivity! Not that I will be showing much of it or any at all really...! Speaking of BHT, BHA/BHT is short for Butylated Hydroxyanisole (BHA) and Butylated Hydroxytoluene (BHT), both of which are chemical preservatives. BHA and BHT have been banned from human use in many countries. In the US, they are still permitted in pet foods. Apparently, though, they have also been allowed, for many years and to this day, as one of the preservatives on certain products meant for human consumption. BHA is generally used to keep fats from becoming rancid. It is also used as a yeast de-foaming agent. BHA is found in butter, meats, cereals, chewing gum, baked goods, snack foods, dehydrated potatoes, and beer. It is also found in animal feed, food packaging, cosmetics, rubber products, and petroleum products. BHT also prevents oxidative rancidity of fats. It is used to preserve food odor, color, and flavor. Many packaging materials incorporate BHT. It is also added directly to shortening, cereals, and other foods containing fats and oils. There is a far more positive side to BHA/BHT than the ability to prevent fat spoilage, and it is this: both BHA and BHT have undergone the additive application and review process required by the US Food and Drug Administration. However, the same chemical properties which make BHA and BHT excellent preservatives may also be implicated in health effects. The oxidative characteristics and/or metabolites of BHA and BHT may contribute to carcinogenicity or tumorigenicity; however the same reactions may combat oxidative stress. There is evidence that certain persons may have difficulty metabolizing BHA and BHT, resulting in health and behavior changes. BHA and BHT may have antiviral and antimicrobial activities. Research is underway concerning the use of BHT in the treatment of herpes simplex and AIDS. Wow - such high hopes for these chemical structures; surely for naught! That'll be the day when man-made compounds can reverse the effects of a bonafide End Times Plague...! Once again, the concept comes packed with good intentions; On the horizon are bananas that produce human vaccines against infectious diseases such as hepatitis B; fish that mature more quickly; fruit and nut trees that yield years earlier, and plants that produce new plastics with unique properties. Hmm... There's truly a little something for everyone in there! All industries would benefit from the full-time instauration of these new norms - and profit is everything, right? Enhanced taste and quality of the crops - whatever it is, it will also be ripe faster than ever before, and speedier maturation equals more profits! It also would have a longer shelf life... No one stopped to think then about the DIGESTION of these; what of that? Talk about potential catastrophic tummy troubles here...! Not to mention the effects of all this on mother nature; that which surrounds man, the consumer/destroyer, said nature that is only on LOAN to him, but he seems not to grasp that notion very well...? "A year after…a massive spraying…there was not a sound of the song of bird….. What was man doing to…our beautiful world…Who has made the decision that sets in motion…this ever-widening wave of death." Direct Cancer and Degenerative Disease Links - In 1994, FDA approved Monsanto's rBGH, a genetically produced growth hormone, for injection into dairy cows – even though scientists warned the resulting increase of IGF-1, a potent chemical hormone, is linked to 400-500% higher risks of human breast, prostrate, and colon cancer. According to Dr. Samuel Epstein of the University of Chicago, it "induces the malignant transformation of human breast epithelial cells." Rat studies confirmed the suspicion and showed internal organ damage with rBGH ingestion. In fact, the FDA's own experiments indicated a spleen mass increase of 46% - a sign of developing leukemia. The contention was that the hormone was killed by pasteurization. But in research conducted by two Monsanto scientists, Ted Elasser and Brian McBride, only 19% of the hormone was destroyed despite boiling milk for 30 minutes when normal pasteurization is 30 seconds. Canada, the European Union, Australia and New Zealand have banned rBGR. The UN's Codex Alimentarius, an international health standards setting body, refused to certify rBGH as safe. Yet Monsanto continues to market this product in the US. Recorded Deaths from GM - In 1989, dozens of Americans died and several thousands were afflicted and impaired by a genetically altered version of the food supplement – L-tryptophan. A settlement of $2 billion dollars was paid by Showa Denko, Japan’s third largest chemical company. (Mayeno and Gleich, 1994). Near-deaths from Allergic Reactions - In 1996, Brazil nut genes were spliced into soybeans by a company called Pioneer Hi-Bred. Some individuals, however, are so allergic to this nut, they go into apoplectic shock (similar to a severe bee sting reaction) which can cause death. Animal tests confirmed the peril and fortunately the product was removed from the market before any fatalities occurred. "The next case could be less than ideal and the public less fortunate," writes Marion Nestle, head of the Nutrition Department of NYU in an editorial to the New England Journal of Medicine. About 25% of Americans have adverse reactions to foods. 8% of children and 2% of adults have food allergies as tested by blood immunoglobins. Antibiotic Threat – Via Milk - Cows injected with rBGH have a much higher level of udder infections and require more antibiotics. This leaves unacceptable levels of antibiotic residues in the milk. Scientists have warned of public health hazards due to growing antibiotic resistance. Plenty more where that came from: here. Emissions of carbon dioxide have been falling since 1970. However, there were peaks in 1973 and 1979 because of severe winters, the state of the economy and high oil prices (resulting in increased use of coal) in those years. The general decline in carbon dioxide emissions is due to increased efficiency in energy use, a switch from coal to natural gas and nuclear in power stations, a move away from coal towards gas and electricity in the domestic sector and a decline in heavy industry. Transport is the only sector that shows an increase in CO2 emissions. This reflects the increase in road traffic, which has outweighed improvements in energy efficiency of vehicles. Carbon dioxide emissions are expected to rise again after 2005 despite the use of more advanced technology and abatement equipment. Consumption of fossil fuels is likely to increase with increasing energy demands and decreased use of nuclear power for electricity production. What is being done about it, you asked? I can't sleep even, because of NOISE POLLUTION...!!! I can't walk around and breathe to my... lungs content really, cause everywhere I go, there's air pollution of some kind. Gee... you might as well be dead indeed! But... I am not! I am alive! I will survive! So will so many that shouldn't, though - the very ones who are making this mess and others, even more insidious, messes! It is getting really hard to do as Anna Nalick suggests though - and that is just to "BREATHE". As for Miss Nalick; it's just a physical resemblance - I hope.